GeishaGlam by C+I ~ Get Exclusive Berry Beau Monde Designs for FREE! 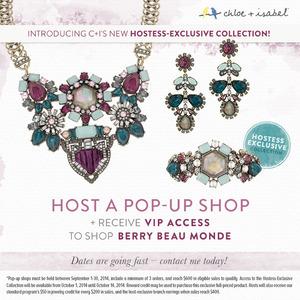 Every month, Chloe+Isabel dangles a sparkly carrot of coolness as an incentive for those who host online, in-person or wherever-you-want-to-be parties, featuring our jewelry collection. This month is the exclusive Berry Beau Monde line that we merchandisers don’t even have access to getting. #JEALOUSY! With that said, take advantage of this promotion by contacting me to host a pop-up shop + receive VIP access to these stunning pieces! Previous GeishaGlam by C+I ~ An Organic Chain + Leaf, Loving on Each Other Next GeishaGlam by C+I ~ From the Board*Room to the Bar*Room!